Home / News / ANN WAIGURU is so cheap just like Koinange prostitutes! See what Lawyer KAMOTHO WAIGANJO used to lure her and win her love? ANN WAIGURU is so cheap just like Koinange prostitutes! See what Lawyer KAMOTHO WAIGANJO used to lure her and win her love? 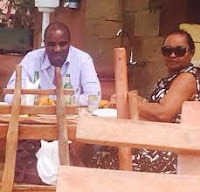 Sunday February 24, 2019-On 16th February, renowned city lawyer, Kamotho Waiganjo, took his relationship with Kirinyaga Governor Ann Waiguru a notch higher through a traditional engagement in a "no-photo" event. Kamotho paid dowry, paid for the locked gate to be opened then identified his love among women who had covered themselves to look similar to his love in accordance with Kikuyu tradition. Their relationship began nearly 10 years ago when the two had traveled to Mombasa a constitutional conference. While in a ferry at Likoni, the two lovebirds shared a meal of soda and bread, that is when Kamotho realized that Waiguru was just a basic girl and not that expensive as some would say. As days passed by, Kamotho requested for a date, and after long hesitation, she submitted and they had their first date at Thai Restaurant in Nairobi, but the their date did not go well as Waiguru was always busy on phone. Over the years, Kamotho and Waiguru have had ups and downs in their relationship but luckily, they worked through them and now they have decided to marry. Did you just call her a koinange prostitute..are you aware you can get sued for this?? ?